Last week, having been inspired by (of all things) this awesome and awful samsung gear commercial, i ordered a Pebble smartwatch. I can’t remember the last time I wore a watch — maybe it was 20 years ago in high school. My standard line for the past 10 years has been “why do I need a watch when I have my phone?”. I’ve carried my watchlessness as a some kind of badge of honor since then, pledging my allegiance to the post-watch generation. But this is different, of course, as smart watches so much smart watches as wearable computers with a watch app. There is almost no question tha wearable computers are going to be a big part of our future, so we might as well start experimenting with them. Apps: the thing I’m most excited about with Pebble is that it’s an app platform, with developers starting to experiment with features that are uniquely suited to a connected watch. But it’s not yet clear to me what the “killer app” for this watch is. The use case that seems most appealing to me is calendar integration — specifically, prompting me with information about the when & where of the specific meeting I’m heading to. I also like the idea of the vibrating alarm (though I don’t really like sleeping with it on). Email and SMS notifications are OK. I can’t wait for my first chance to check in with Foursquare from my watch. That said, the process of setting up the phone did (IMO) a really bad job pointing me to where all the apps are. The “Get Watch Apps” button included in the Pebble app just links to a list of skins for the default time-telling feature. I had to google to find the Pebble Apps app, a Play store directory of available pebble apps. So the initial experience was kind of disappointing — I couldn’t get the app to do much more than tell the time and receive text messages. I was confused — like “isn’t this supposed to be able to do more?”. Just an issue with the onboarding process that should be relatively easy to fix. Comfort: wearing a watch is cumbersome and annoying to begin with, and this watch is a bit bulky. So right off the bat, it has made me feel a little bit uncomfortable. Also, and maybe this is just the way my arms and hands are put together, but I haven’t found a really comfortable way to push the buttons yet. I’m either reaching over the top of the watch awkwardly or reaching around the bottom of the watch awkwardly. UX: The basic UX of the watch is pretty simple — a “back” button on the left side, and “up” “down” and “enter” buttons on the right. You click through a series of side-by-side screens similarly to how you did on early ipods. Again, I feel like there is a lot of room for improvement in the way the app works — especially the onboarding process, where there are some glitches (asking me to connect to my phone even though i’m already connected), and some missed opportunities (pointers to apps, as I mentioned above). There are a bunch of rough edges — for example, when you load a new app onto the phone, the progress bar gets to the end but then nothing happens prompting you to do the next thing. And try as I might, I can’t configure my gmail to notify me with my Priority inbox emails rather than the firehose inbox (which, if I can’t fix it, will result in me just turning email notifications off). Also, the connections between the pebble core app and all of pebble “apps” is confusing, as you bounce around between a variety of apps (the core pebble app, the pebble “loader” app which loads apps onto the phone, the Pebble app catalog app, each individual app, etc). It’s disjointed and confusing. All in all, none of these are deal breakers, and I’m sure are just the result of this being a really new platform. I just hope that enough of the folks who got Pebbles as Christmas gifts aren’t thrown by it, especially the less technical / geeky ones. So, in conclusion — there’s no question that there is a lot of potential here. 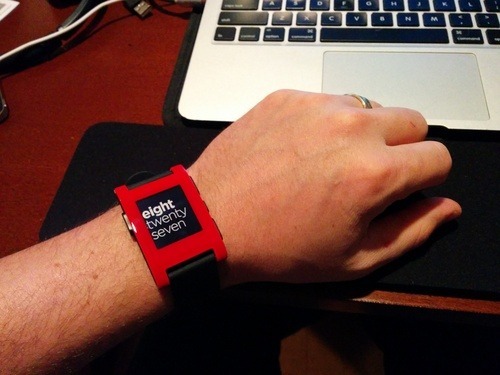 And I really like the Pebble story and approach, and the fact that they are an independent player. So I am rooting for them, and I will keep wearing the watch, for at least the next few weeks, to see what other habits form or great use cases emerge.